The public is deeply divided over the two fundamental questions lawmakers are struggling with: how to handle illegal immigrants already in the U.S.; and how to stem the flow of illegal immigrants in the future. A narrow majority of the public (53%) believes that illegal immigrants should be required to go home, compared with 40% who feel they should be granted some kind of legal status allowing them to stay in this country. But when the option of a temporary worker program is introduced, the fissures in public attitudes toward immigration become even more evident. As championed by President Bush, such a program would allow illegal immigrants to remain in the U.S. for a fixed amount of time on the condition they eventually go home. 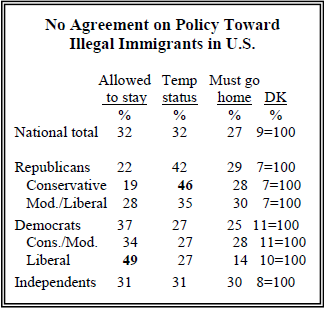 With this option on the table, opinion is almost evenly divided between those who favor allowing some illegal immigrants to remain in the U.S. under a temporary work program (32%); those who say illegal immigrants should be allowed to stay permanently (32%); and those who believe they should go home (27%). Partisan and ideological differences are evident in attitudes towards these options. A plurality of conservative Republicans (46%) favors allowing some illegal immigrants to remain in the U.S. under a temporary worker program. In sharp contrast, the preferred option among liberal Democrats is to make it possible for illegal immigrants to say in the country permanently. Other partisan groups and independents split fairly evenly among the three alternatives. Americans are more united in their attitudes toward stopping the flow of illegal immigration across the Mexican border. 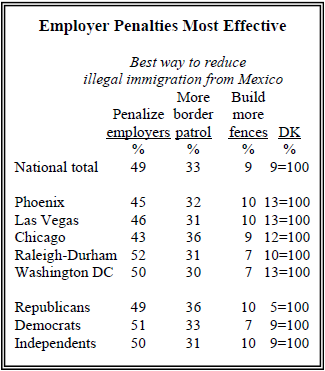 A near majority of the public (49%) favors increasing penalties on employers who hire illegal immigrants. Nonetheless, a comparable, though smaller share (42%), favors two initiatives that would step up border enforcement by increasing the number of border patrol agents (33%) and building more fences on the border (9%). Since the early 1990s substantial stretches of fencing have been built along parts of the border in California and Texas that were once the highest traffic zones for illegal crossings, and the number of Border Patrol agents in those areas has also been greatly increased. As a result, much of the traffic has been funneled into the rugged desert areas of the Arizona border, provoking several years of controversy and political activity in that state on the immigration issue. Even so, residents of the Phoenix metropolitan area offer views that are similar to those voiced nationally in weighing enforcement priorities. On the question of reducing illegal immigration from Mexico, 45% say the best way to achieve that goal would be to increase penalties on employers who hire illegals; 32% say increasing the number of border patrol agents would be most effective; and just 10% feel that building more fences on the border would be most effective. Similar views emerged in surveys of metropolitan areas that have also had rapid growth of the foreign-born population but that are far from the border, such as Chicago and Washington, DC. 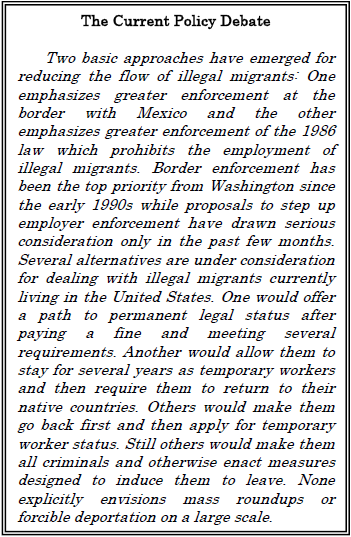 The idea of reducing illegal immigration by prohibiting employment first gained currency in the mid-1970s, and there has been an off-and-on debate about how such a measure should be enforced ever since then. Two critical issues have arisen repeatedly: What kind of documentation should a prospective hire have to present to show they are a U.S. citizen or a legal immigrant and what should an employer have to do to verify that the documents are genuine. When immigration legislation was enacted in 1986, Congress and the Reagan administration rejected proposals to create a national identity card to prove legal status and employers were given wide latitude in deciding the authenticity of documents. The law has been so difficult to enforce that the number of cases brought against employers is about half what it was a decade ago even though the number of unauthorized workers has roughly doubled in that time. Americans have clear opinions about how to enforce the law against the employment of illegal migrants. Asked about two of the major proposals that have been before Congress over the past year, two-thirds (66%) said they favored the creation of a new government database of everyone eligible to work—both American citizens and legal immigrants, and requiring employers to check that database before hiring someone for any kind of work. And three-quarters (76%) said they favored requiring everyone seeking a new job to have a new kind of driver’s license or Social Security card that proves they are U.S. citizens or are in the country legally. Support for both measures is widespread and nearly uniform across a variety of social, economic and political subgroups. More than 60% of Hispanics support both proposals as do a majority of recent immigrants. Most college graduates favor these proposals, though there is more opposition here than among the less educated. And younger people are somewhat more likely to oppose requiring a new government ID card to gain employment, though two-thirds think this is a good idea. Another approach that is the subject of debate in state capitals around the country is to discourage illegal migration and reduce its fiscal impact by denying social services to the unauthorized. Americans support this idea with two-thirds (67%) saying that illegal immigrants should not be eligible for social services provided by state and local governments. As with support for the measure to enforce the prohibition on employment, this is a broadly based view. At the same time, however, the public distinguishes between the migrants and their children and is unwilling to penalize the youngsters. More than two-thirds (71%) say that the children of illegal immigrants should be allowed to attend public schools. Public schools are currently obliged to educate youngsters regardless of their immigration status under a 1982 U.S. Supreme Court decision holding that children cannot be held accountable for their parents’ decision to migrate illegally. There is a sharp divide on these issues between people who themselves or whose parents immigrated to the U.S. and those whose family background is rooted in the United States at least through their grandparents’ generation. 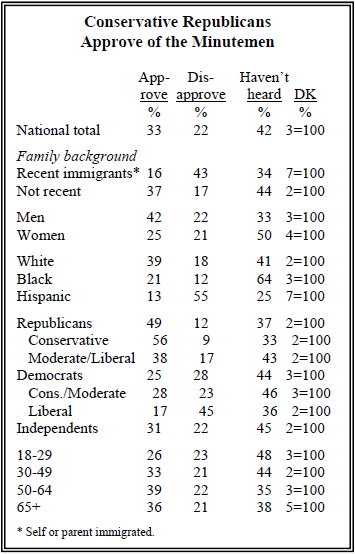 Those from more recent immigrant backgrounds support making illegal immigrants eligible for social services by a 54% to 41% margin. By contrast, people whose families have been here longer oppose that idea, by 73%-32%. Four-in-ten young people, those under age 30, believe illegal immigrants should be eligible for government-provided social services, compared with smaller percentages of older Americans. Even so, a solid majority of those ages 18-29 (57%) say illegal immigrants should not be eligible for these services. More than twice as many Democrats as Republicans favor permitting illegal immigrants to be eligible for social services (38% vs. 16%). But Democrats, in particular, are split along ideological lines. Conservative and moderate Democrats, by 62%-34% say illegal immigrants should not be eligible for government services, while liberals are evenly divided (48% favor/50% oppose). Opinion is more closely divided on another point of law regarding the children of unauthorized migrants. Under the Constitution anyone born in the United States is automatically a U.S. citizen regardless of their parents’ immigration status. A slim majority of Americans (54%) favor keeping the Constitution as it is while a substantial minority (42%) would like to change it so that parents would have to be legal residents of the U.S. for a newborn to be a citizen. Levels of support for a change in the constitutional definition of citizenship vary significantly by race, education and political ideology. Whites (47%) back the idea more than either blacks (36%) or Hispanics (23%). Among whites, support is notably higher among those with less than a college education (50%) than with those with a degree from a four-year college (36%). As is the case with allowing illegals to be eligible for government services, Democrats are deeply divided over amending the Constitution so that the parents of a child must be legal residents for their child to be a citizen. Liberal Democrats oppose such a change by more than two-to-one (68%-27%), while conservatives and moderates are more closely divided (41% favor/56% oppose). The public’s divisions over policies toward dealing with illegal immigration are mirrored in views of the appropriate level of legal immigration into the U.S. The number of new immigrants admitted for permanent legal residence has averaged a bit more than 900,000 a year over the past decade compared to less than 600,000 in the 1980s and somewhat more than 400,000 in the 1970s. None of the major bills being debated in Congress over the past year propose cuts in legal immigration. Roughly equal shares of Americans favor the opposite approaches of keeping legal immigration at its present levels (37%) and decreasing it (40%). 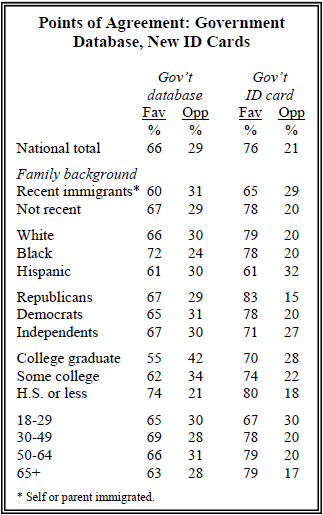 A much smaller percentage (17%) favors increasing legal immigration. Partisan and ideological differences are also apparent on this policy issue. Just 26% of liberal Democrats want immigration decreased, compared with 43% of conservative and moderate Democrats, as well as a similar share of independents (39%) and Republicans (43%). In fact, liberal Democrats are just as likely to say immigration should be increased as decreased, a view that diverges starkly from the rest of the population. Education also plays a significant role in people’s views, particularly in combination with race. 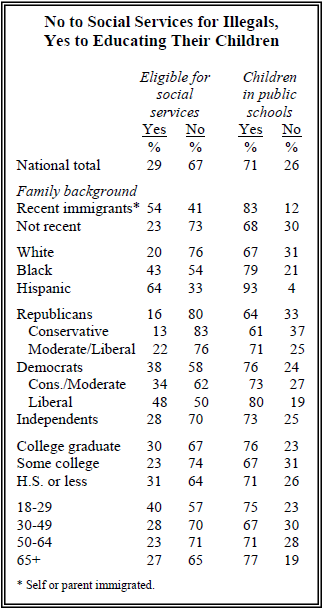 A plurality of college graduates (46%) favor keeping legal immigration levels as they are now, while the balance of opinion among those with less education favors reducing immigration. Sentiment for decreasing legal flows is particularly strong among whites who do not have a diploma from a four-year college (49%) than among whites with a four-year degree (27%). The distinction between attitudes toward legal and illegal immigration is perhaps best seen in Phoenix, where a high proportion rate immigration as a very big local problem. Yet about as many Phoenix residents say legal immigration should be increased (26%) as say it should be decreased (30%). In the four other metropolitan areas, and the national survey, significantly more respondents favor a cutback, rather than an increase, in the rate of legal immigration. As the policy debate over immigration has heated up in recent months, a considerable amount of attention in the news media has been devoted to the “Minutemen,” a group that looks for illegal migrants along the border with Mexico in order to report them to the authorities. A plurality of Americans (42%) had not heard about them. Among those who have, 33% say they approve of the Minutemen’s patrols of the Mexican border, while 22% disapprove. These attitudes differ greatly by gender with 42% of men expressing approval compared to 25% of women. Differences also are evident by race and ethnicity. 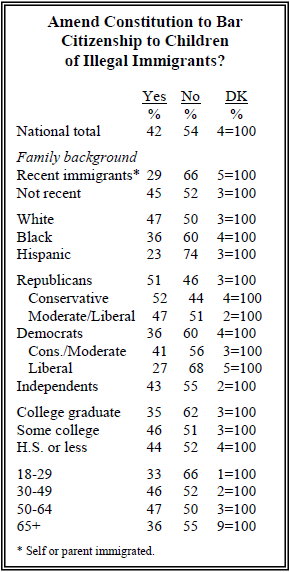 Americans of Hispanic background overwhelmingly disapprove of the Minutemen (55% vs.13% who approve), as do Americans whose parents or who themselves immigrated to the U.S. (43% disapprove/16% approve). Republicans generally approve of the Minutemen’s activities, and conservative Republicans have an especially positive reaction to this group (56% approve/9% disapprove). Democrats are more evenly divided: 25% approve, 28% disapprove and 44% have not heard about them. 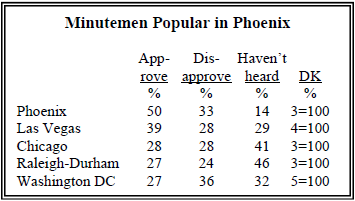 Half of respondents in the survey of the Phoenix metropolitan area say they approve of the Minutemen’s patrols, while 33% disapprove. Not surprisingly, most Phoenix residents have heard of the group (83%). Las Vegas residents also tend to approve (39%) more than disapprove (28%) of the Minutemen. Residents of Chicago and Raleigh-Durham were the least likely to have heard about the Minutemen, and were divided over their actions, and Washingtonians tended to disapprove (36%) more than approve (27%).